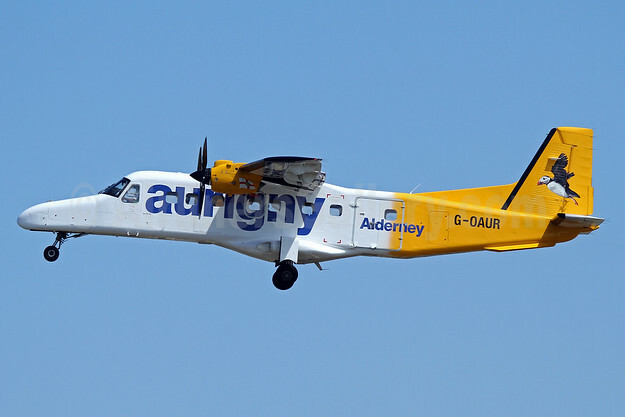 Aurigny has taken delivery of its second New Generation Dornier 228 aircraft, marking an important investment in its Alderney, Southampton and Dinard services. The aircraft is due to operate its maiden commercial flight later this week. It arrives with the registration, G-ETAC (below), in homage to Les Etacs rocks in Alderney, an iconic islet and home to a large colony of gannets. The new G-ETAC went into revenue service on September 20, 2018. It joins Aurigny’s other New Generation Dornier G-OAUR (top), which arrived in 2015. They will now provide the majority of inter-island flying, with back up from a Classic Dornier aircraft. The arrival of G-ETAC had been delayed by the manufacturer RUAG. Due to the delay in delivery, RUAG provided Aurigny with another Classic Dornier aircraft, G-OMAF, to ensure adequate cover on the inter-island services. This loan comes to an end with the arrival of G-ETAC and G-OMAF has been returned. Aurigny CEO Mark Darby said: “We are delighted to take delivery of G-ETAC. The aircraft is equipped with the latest New Generation systems and has comfortable seats, to provide the very best customer experience. Top Copyright Photo (all others by Aurigny): Aurigny Air Services Dornier 228-212 G-OAUR (msn 8305) GCI (Nick Dean). Image: 933761. This entry was posted in Aurigny Air Services and tagged Aurigny Air Services, Dornier 228-212, G-ETAC, G-OAUR, msn 8305 on September 24, 2018 by Bruce Drum.